The organisation that manages Grenfell Tower is to be stripped of responsibility for the west London estate it is part of, the PM has said. Theresa May said she had a "respectful" meeting with survivors of the fire, which left at least 80 dead. She said residents were "pleased" to hear the tenant management organisation was being stripped of its powers. Meanwhile, council leaders have said nine permanent accommodation offers have now been accepted by survivors. Kensington and Chelsea Council said one household had moved into a new home, but more than 180 remain in hotels and temporary accommodation. Can public inquiries ever satisfy everyone? Mrs May held a private meeting with about 60 or 70 residents on Tuesday, before speaking to the leader of the council to pass on the concerns raised. Speaking to the BBC, she said residents were concerned about Kensington and Chelsea Tenant Management Organisation (TMO), which was responsible for Grenfell Tower and the surrounding area. "I was pleased that I was able to tell them... that the tenant management organisation will no longer have responsibility for the Lancaster West housing estate." She added: "People were pleased to hear that." The TMO, which was established in 1996 to manage almost 10,000 properties in the borough, has been heavily criticised by residents following the fire. Mrs May said she was also asked about emergency funds, including charitable donations, reaching survivors. "Obviously, the Charities Commission and others have been involved in ensuring that that is happening," she added. Downing Street said the prime minister attended the meeting "at the invitation of the residents" and also discussed support for bereaved families and plans for the Grenfell inquiry. She told residents the council had not responded quickly enough after the fire and they, in turn, told her about the "ongoing challenges they face", the statement said. 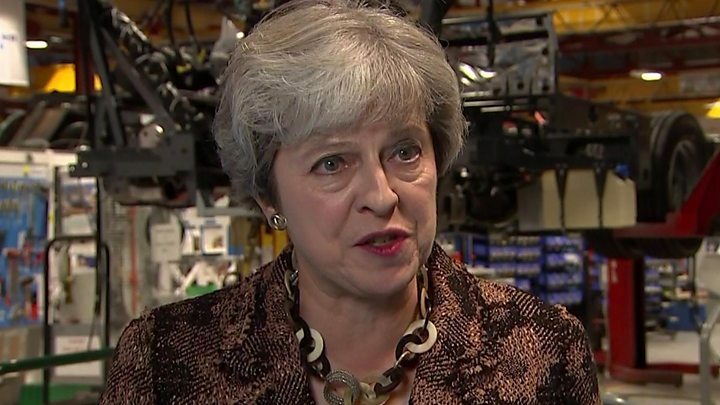 It comes after Mrs May faced criticism for initially failing to meet survivors when she visited the scene after the tragedy. She was also booed during a later visit. The leader of Kensington and Chelsea Council, Elizabeth Campbell, she would consider "all options" for future management of the estate. She said there was "no future role" for the TMO in the Lancaster West estate and residents would be consulted about a replacement. Cllr Campbell also vowed the council would spend "every penny" of its reserves on rehousing victims - and £76m would be made available on Thursday. "We've built up reserves and we built them up in case of emergencies, and this is an emergency. And we will spend that," she said. "That's right that we should do it - these are our neighbours. If you don't spend money on your neighbours in an emergency, then when do you spend it?" She said victims still living in temporary accommodation would be rehoused as soon as possible, but it would be done according to "their need, not speed". Meanwhile, Ernie Vital, 50, is the latest victim of the fire to be formally identified. It brings the total to 54 so far, including baby Logan Gomes, who was stillborn in hospital after the blaze. Mr Vital was described by his family as a "kind, sensitive and caring" son. "He was a creative individual who pursued a creative life," the statement read. "He was a proud, humble, mature and independent man. He was a loyal son and a law-abiding citizen who maintained good relationships with all those he met in society." Mr Vital, who worked in the catering industry, died alongside his mother, Marjorie Vital, with whom he lived on the 16th floor. She was confirmed dead at an inquest in July. His "pursuit of happiness has been abruptly and dramatically stopped by the Grenfell Tower tragedy" and his family and friends "will miss him dearly", the statement added. Inquests into four more victims of the tragedy are due to be opened at Westminster Coroner's Court later. Iranian-born sisters Sakineh and Fatemeh Afrasiabi lived on the 18th floor, having moved to the UK in 1997. Sakineh, 65, was disabled and was only able to move with the help of a walking stick, while Fatemeh suffered acute arthritis, according to her daughter, Aklani. Inquests will also begin into the deaths of Mariem Elgwahry, 27, and 45-year-old Deborah Lamprell. Grenfell: Can public inquiries ever satisfy everyone?